FOOTBALLERS representing the Camden and Islington District team are hoping to find out next week who they will face in the final of the prestigious Gill Cup. Youngsters from the Under-13s side, which is made up of all the top players from the two boroughs, have been counting down the days to the grand finale, which is set to be held towards the end of the month. The all-conquering squad sealed their place in the final with a thrilling 3-2 victory over Barking and Dagenham at Market Road. The team started the game brightly and took an early lead when Jacob Jervis-Bond’s first time pass released Enoch Adjei, who showed composure beyond his years to confidently beat the keeper. Barking and Dagenham equalised just before half-time to leave the result hanging in the balance. Camden and Islington battled back to retake the lead on the hour mark courtesy of another instinctive finish from Adjei. The excellent Adam Forrester and Brian Lyimo combined well on the wing, and, when the latter’s shot bounced back off the bar, Adjei pounced to net his second of the game. But the Year 8 boys again failed to hold on to their advantage as the visitors levelled the scores. With extra-time looming, Jervis-Bond slipped past a defender and fired a low shot into the net to earn his team a place in the final. The victory continues an impressive run of results which have seen the Camden and Islington team beat sides from Hackney, Barnet and Redbridge on their way to the final. Manager Everett Jervis, who coaches the team alongside Indy Singh, was delighted with the way his team won through to the final. He said: “The most important thing is that the players learn how to express themselves on the pitch and enjoy their football. “The boys have been working really hard in training, but at the same time managed to maintain a fun atmosphere while improving their technical abilities. “The whole team is really looking forward to finding out who they’ll now be playing in the final, and where the game will be held. 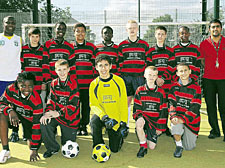 Camden and Islington Under-13s are pictured, above, back row, from left: manager Everett Jervis, Kaleb Rogan, Nii Amarifo, Jacob Jervis-Bond, Enoch Adjei, Adam Forrester, Bradley Martin, Brian Lyimo and coach Indy Singh. Front Row: Levi Gordon, Archie Roberts, Erol Resal, George McLean and Dillon White. Camden and Islington’s Under-13s player Elliot Isaac-Boreham is missing from the line-up.